If you need help with the cleaning of the kitchen in your home or restaurant let out qualified staff take care of the work. They can make your kitchen perfectly clean, rid of food leftovers, crumbs and grease. After inspection of the kitchen, the customer will receive a quote to check and approve. We can implement effective sanitising of all appliances, cabinets, worktops, shelves and items in the kitchen using suitable cleaning solutions and detergents. 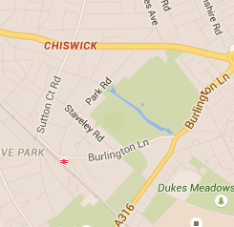 Get in touch with our company which is located in Chiswick to book your kitchen cleaning for a preferred day and time. Our cleaners have undergone professional trainings and know how to make customers pleased with their work. They will check the condition and size of the kitchen and prepare a quotation for the customer to approve. Our staff use high-quality detergents and de-greasers to clean hobs, ovens, microwaves, extractor fans and all dirty kitchen areas. They take apart the detachable components of the appliances to clean them separately in the dip tanks mounted in their vans. After all parts are properly sanitised, the cleaners rinse, wipe and reassemble them. 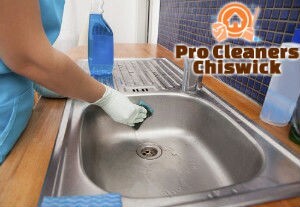 We guarantee you excellent kitchen cleaning which you can have in W4 during weekdays, weekends and holidays without increase of the price. Over time kitchens get filled with greasy stains, crumbs, dirt and need effective sanitising. Our cleaners can make the kitchen areas in your home, rented flat and restaurant impeccable by providing effective and thorough sanitising of all items in it. 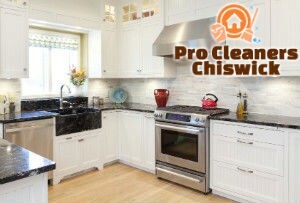 Use our reliable kitchen cleaning services that we implement in the Chiswick, W4 region and nearby to property owners, landlords and tenants.